'OH, East is East, and West is West, and never the twain shall meet.' The chorus of Rudyard Kipling’s famous Ballad of East and West can aptly be applied to Bangalore – a city of layers – a twin city with the European Cantonment to the East and the Indian Pettah to the West and Cubbon Park in between planned as a visual barrier to separate the two! Join us to find out if the two ever met and along the way experience a bit of Cantonment life along with a few surprises thrown in. This is a limited participation. Please call 9986023014 in advance to register for the event. Into Cubbon Park through Victoria Statue entrance. St Mark’s cathedral is on MG road. Please enter through the gate on the other i.e. Koshy's side and wait at the BCP USE banner. - Remember to bring a cap, umbrella and a bottle of water. 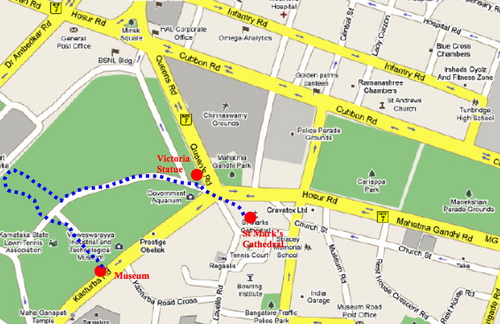 - You can park on the road in front of St Mark’s Cathedral or inside Cubbon park near Victoria Statue. The event will close at the Museum, a short walk away (about half a km). 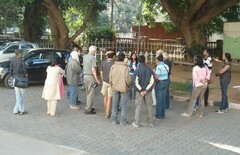 - Overall the walk will be about 2.5 to 3 Km and the event will last about 3 hours. This event was open only to those who had registered ahead and numbers were restricted (30). There was a very good response. 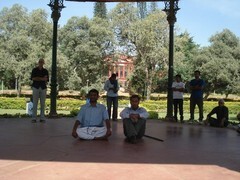 This was the first event where BCP was collaborating with INTACH Bangalore and we hope not the last. 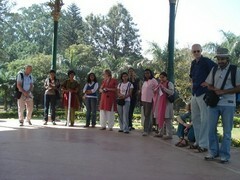 Poornima Dasarathi and Meera Iyer INTACH Bangalore members led the walk. Pankaj and Krupa representing UDBHAVA were responsible for logistics and the 'surprise' i.e. the skit came to us courtesy MPSR Foundation (represented by Daya). We started at St Mark's Cathedral at 8am where Poornima described the history leading to the founding of the Cantonment and the role of St Mark's in the newly established Cantonment. 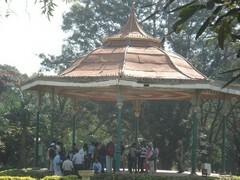 We then entered Cubbon Park through Victoria Statue entrance and walked down to the Bandstand. Here we were entertained by a 10 min skit on the theme of the event (it was a scene depicting the interaction between two friends - one settled in the Cantonment and the other in the Old City or Pettah. We felt that staging it in the bandstand definitely enhanced the viewer experience. This was followed by a short break for refreshments and we walked onto Attara Kutcheri (rear entrance) where Poornima, Meera and Pankaj took turns to speak about the structure's history and describe its architectural style. From there we headed to Seshadri Iyer Hall, where Poornima and Krupa similarly described the structure, Chamaraja Wodeyar Statue and finally the Museum. Meera pointed out some of the highlights of the museum's collections and we left the group there to wander around at leisure. The feedback was very encouraging. Participants were extremely appreciative of the efforts put together by all collaborators.